THE relentless rise in feedgrain prices this year continues to impact grainfed cattle profitability, illustrated in Beef Central’s latest monthly 100-day grainfed trading budget compiled this morning. The calculation, using our standard set of variables (see list at base of page) shows a budgeted loss of $62 for a typical flatback feeder steer entering a Darling Downs commercial feedyard today, and closing out for slaughter after 105 days on feed in mid-October. That figure is a $31 deterioration in result since our last breakeven this time last month. While today’s result represents a setback, it’s still a long way from a record $155 loss recorded in February, which highlighted the difficult trading conditions for lotfeeders over the past 12 months. For today’s calculation, we’ve nominated a feeder steer buy price (flatback, 450kg) of 270c/kg – 5c better than late May, due to continued solid demand and limited supply. Worth noting again is the big variance in price between our standard flatback heavy feeder and Angus descriptions, which market participants this week quoted as 40-50c/kg higher, at 320-330c. That’s being driven mostly by feedlot/processor program business and support for Angus brand programs, but may also reflect, to some extent, demand out of China for live export. Some contacts say there is evidence of a higher proportion of black feeders in Queensland yards at present – especially corporate-owned yards – due to that brand program business and access to feeders out of very dry parts of southern Australia. Despite the 5c/kg rise in today’s feeder steer quoted price, it still sits close to the lowest figure we’ve published for this report series since April 2015 (255c/kg), just as the big surge started in store and finished cattle prices across Australia. At its peak in June 2016, flatback feeders fitting our description were worth 360c/kg, peaking in between our reports at 370-380c. That means a feeder purchased today is worth $405 less than it was at the market’s 2016 peak. Today’s 270c/kg purchase price values our steer at $1215. Compare this with a similar time last year, when the same feeder was worth 320c/kg ($1440), an advantage of $225 today. Darling Downs feedlot rations have continued to creep up in price over the past month, based on exposure to all-time record feedgrain prices. For today’s trading budget, we’ve added another $5/kg to rations to $415/t – a $35/t lift in the past eight weeks or nine weeks. That’s the highest ration price recorded in the seven years that this report has been compiled. White grains delivered Darling Downs were quoted on Grain Central’s regular feedgrain report last week at $412/t for barley and $402 for wheat, and may have risen since. Compare today’s figure with 12 months ago when the ration price was $340/t, and it adds an additional $75/t to the custom feed bill. 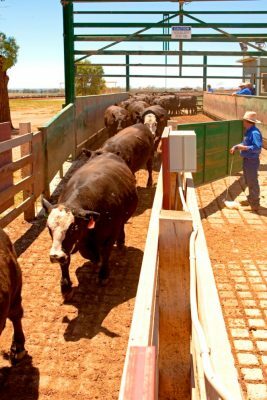 Any feedlots with healthier grain positions would be in a great space at present, but regardless of grain reserves held, most – if not all – custom feedyards price their ration off the spot market price for grain, Beef Central was told. Ration prices at current levels continue to damage prospects of a positive trade on today’s 100-day grainfed steer budget, delivering a total feeding cost over 105 days of a record $650, compared with $532 12 months ago. Total production cost (combining feeder steer price, freight, induction, feeding and other associated costs) this morning was $1967, down from $2079 a year ago, when feeder price was so much higher. Given the current high cost of rations, lotfeeders today are clearly favouring buying in-spec cattle, rather than trying to feed lighter cattle on. That’s in stark contrast with 12 months ago, when feedlot were paying clear premiums for lighter cattle, due to cost of gain advantage, with rations increasing around $75/t in value since then. Due to the record-high ration price, cost of gain for our typical southern Queensland feedlot in today’s calculation is a record 310c/kg (6c/kg higher than May, and 56c/kg above this time last year, when it made financial sense to on-feed lighter cattle). While our regular breakeven report is based on operations on the Darling Downs, it’s worth noting that cost of gain this week for lotfeeding operations in southern NSW – closer to the grain source – is around 260c/kg. 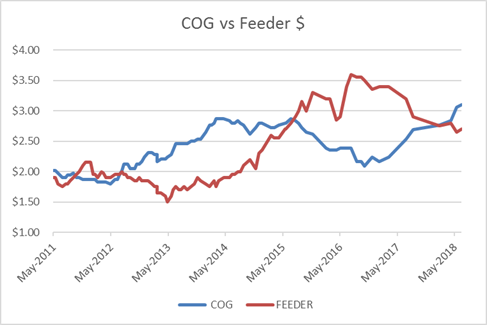 As the graph published here shows, there’s recently been a shift in the relationship between feeder price and cost of gain in Queensland, after two years where the feeder price was higher than the cost to feed, which inevitably encouraged some lotfeeders to select lighter cattle, and feed them longer, to maximise the benefit. The above set of variables has delivered a breakeven figure in today’s calculation of 558c/kg (up 9c/kg since our May report), against a forward contract price from SEQ processors for 100-day steers ready for slaughter mid-October of 540c/kg. That 18c difference represents a $62 loss on the trade, based on our standard set of variables – double the loss recorded in our last budget at the end of May. That’s due to the slight lift in feeder price, plus the record highs seen in ration costs. The more competitive value of the Australia dollar recently has helped underpin forward price on grainfed cattle, delivering continued good trading conditions for processors. The widespread expectation that slaughter cattle will be horribly scarce come September/October is also helping support forward prices. As Beef Central often reminds readers, profit/loss results on cattle will vary somewhat, depending on performance of cattle and ration. While our chosen ADG of 2kg/day is representative of ‘middle of the road’ performance in Queensland feedyards, for cattle performing 10pc better (2.2kg/day ADG), the feeding efficiency goes from 7.5: 1 to 6.82:1, meaning the breakeven figure drops to 540c. In that case, those better-performing cattle would deliver a breakeven result, compared with the current forward grainfed bullock price. Looking back at 100-day grainfed ox being delivered to processors for slaughter this week, if those cattle were bought on forward contract back in March, they were worth around 530c/kg – identical to the competitive spot-market price today for the same grainfed export ox. That means processors are neither benefitting nor losing from buying cattle forward three months ago, compared with purchasing in today’s spot market. With the next quarterly feedlot survey report for the June quarter still four to six weeks away, market participants say lotfeeding numbers across eastern Australia appear to remain at high levels, despite the less-than-ideal trading conditions. Beef Central’s regular 100-day grainfed breakeven scenario is based on a standard set of representative production variables, ex Darling Downs. It is built on a feeder steer of 450kg liveweight, fed 105 days; 356kg dressed weight at slaughter; ADG of 2kg; consumption 15kg/day and a NFE ratio of 7.5:1 (as fed); $25 freight; typical implant program. Bank interest is included. It is important to note that variations exist across production models (feed conversion, daily gain, mortality, morbidity, carcase specification); from feedlot to feedlot; and between mobs of cattle. Equally, there can be considerable variation at any given time in ration costs charged by different custom-feed service feedlots. Click here to view an earlier article on this topic. For a more specific performance assessment on a given mob of cattle, consult with your preferred custom feeder. Reading the article about feedlot profitability due to the drought driven grain prices was astounding to me. As a beef and grain producer I see both sides clearly. It is very obvious that profits for the feedlot industry are high when grain prices are at lower levels than now. What is needed is a more level playing field for all involved. Would like some feedback..